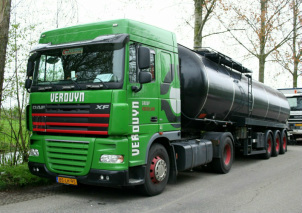 The Dutch haulier Verduyn Group with branches in the Netherlands and the port of Antwerp, is specialized in transport of bitumen and fuels. After a previous successful cooperation with De Putter & Co, which resulted in obtaining the ISO 9001:2008 certificate, the management decided to extend the existing quality management system with aspects of safety, health, environment and security. During the implementation phase, procedures and work instructions have been extended or added. In addition, different risk analyses regarding environment, safety and security have been drawn up and performed. Our consultants also provided additional process indicators, and their continuous follow-up, which are required for BBS (Behaviour Based Safety). After a profound SQAS Transport Service audit, they scored an exceptional 94%.